Some musings on this trend of still cameras doing high quality high res video. Canon announced and will ship very soon, a new DSLR. The EOS 5D MkII. This is a DSLR like many before it. It has many more megapixels that the cameras before it. It does higher ISO that cameras before it. Which is normal too. But what sets it apart is that it can shoot movies at high resolution as well. In fact it can shoot 25fps (maybe even 24fps and 30fps) movies at 1920x1080 pixels. Which is the definition of HD. And which is sufficient for making a film. Even if finally for 35mm movie film. But Canon was not the first camera maker to make such a camera. 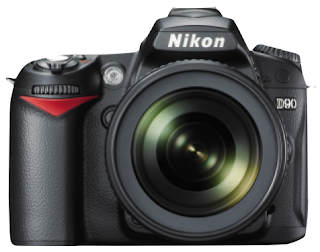 Nikon recently released the D90 which too can do HD movies. But 1280x720. And the Nikon uses (old) M-JPEG compression. Compared to H.264 that Canon uses. There's also another model that can do HD movies. The Canon SX1 IS too does HD movies and also at H.264. Many web sites have described these machines. Some have downloadable results from these cameras. Some have compared the EOS 5D MkII to the Red One and even to the unreleased Red Scarlet. And some have even called this a 'game changer'. I think this is a bit over the top. 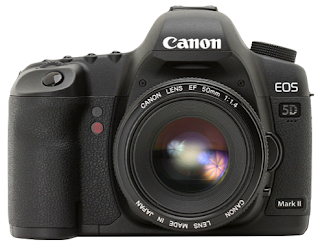 The EOS 5D MkII is basically a still camera. And as good as a camera Canon makes. That it can do HD movies is an additional functionality. But it can't challenge a camera made for doing movies. Some of the limitations of shooting a proper movie with the EOX 5D Mk II as with any other such still camera is lack of some crucial features. 1. You can't adjust focus while 'rolling'. 2. You can't adjust aperture while 'rolling'. 3. It has a still camera grip which isn't exactly comfortable for filming. 4. You can only shoot a few minutes at a time. 5. The movies are highly compressed H.264. 6. Sound may not be as good and there are no professional inputs. 7. The movies are 1080p30 even at Canon's UK site. But to be fair, this is a rather economical HD camera. At $ 2700 the price can't be beat. Lenses are super sharp, still camera, 21 megapixel capable lenses, that can rival film camera lenses. Film camera lenses cost more not necessarily because they are better than still camera lenses. There is volume economics to it as well. Which brings us to the interesting question - why did Nikon and Canon do it? That is, make a still camera that can do high quality movies. And why didn't they just come out with a digital movie camera like the Red, which shoots to hard disk or memory card? Sort of like a successor to the XL-H1? I'm sure both companies have some good reasons, but one of them could be economics. I don't have exact figures, but at between $2000 to $3000, DSLRs probably sell more numbers than movie making cameras. So the cost of developing, and improving on the quality of, and marketing HD-size movie capable imaging chips - CCD or CMOS - gets spread over much larger numbers. And, a large body of discerning eyes - still photographers - take stills and contribute with valuable feedback. So the product gets market tested well. Had this feature of shooting HD movies with a full frame chip been provided in a 'handycam type' camcorder, it would have been wasted in shaky vacation movies. So while I'm not sure about Nikon, but I'm reasonably certain Canon will release a HD or even maybe 4k resolution camera that shoots movies using a imaging chip that's the exact size of the normal 35 mm movie frame. The EOS 5D MKII is just the beginning. And when that happens, that will be a 'game changer'. Amongst the first movies shot with the EOS 5D MkII which was put up on the net, was taken down as it lead to some really heavy downloading that swamped the host site. The movie is now up at Vincent's blog here. If you happen to work in film and video production, post-production, TV broadcasting and other related fields this is the place to go in September. There are loads of things to see, and I saw as many as I could in the 4 days I was there. From notes I kept, here are just some of the things I saw in depth. My impressions. This is a robust grading system which always shows new grading features. And plays nicely with a DVS SAN. There's also a great new direct media workflow with Avid Unity and Avid systems. One can edit on Avid at compressed HD resolutions and have Baselight access the media directly off an Avid Unity. And grade it. Yes, an external application opening and manipulating Avid media. How things change! And after grading on a Baselight, an exported AAF links up with rendered shots with media created by Baselight. When imported back into Media Composer. Cool!. Film Master has new grading features and a new tracker that's very impressive. Conform on the Nucoda has always been the best as is project management. Phoenix and DVO too have evolved with great new automation features. iQ has evolved into version 4 with workflow enhancements. Quantel showed a new workflow with timeline transfer from FCP to Quantel. There's even a multi-track timeline in Quantel now so its even easier to understand. One needs to export an XML and let Automatic Duck do the conversion to AAF. What they don't tell you is you need to buy Automatic Duck to make this work. Red camera files are now natively supported. I didn't get time to check out what kind of workflow is need to go from Red to FCP to Quantel. But I guess this kind of thing becomes clear when you have to do it by yourself. And the grading panel - Neo - is ready and shipping. So no one needs to steal one. A colourist friend tried the panel found some neat features for colourists. So now with this real panel maybe many of the non-believers will sit up and take notice of iQ as a film grading system. Genetic Engineering is also evolving into a good shared workflow solution. Now Quantel just need to open up their storage and make their systems able to operate off others'. Lustre showed 4k workflow as well with a 'Super Incinerator' which seemed to work as it always does, at trade shows. The Lustre interface still seems the same old clunky one with similar limitations with inter operability with other systems. I didn't really spend too much time at Autodesk. Resolve now does 4k. Many models. R100, R350 and R700. But this is all new architecture so existing DaVinci Resolve systems cannot be upgraded to these. DaVinci also have a new panel which was inside a showcase at NAB. Now its out and all the buttons and knobs and balls actually do things. But from what I saw, this new grading panel appears to be still 'work-in-progress'. Scratch has been a simple no-frills grading system at a competitive cost - and it still is. With a software-only version and a Red files only version also available. It even works with a low-cost Tangent Wave grading panel. It has great conform features, and simple yet effective grading. For those who need a viable non-film workflow, maybe for commercials or even TV shows, a Red plus Scratch is still an unbeatable combination. You can start out as low-cost as you want, if you promise yourself that some part of the money you make from starting out cheap, would go into building up the Scratch workstation. Systems I did not see from the grading point of view were Chroma Imaging Matrix, Avid DS (as a grading system), Apple Color (Apple did not participate). DVS-SAN has Spycer and together they make up a reliable fast SAN with excellent CONTENT management. Spycer shows what SAN content manager should be like. It adds value to DVS-SAN by optimising space management. Spycer also does conversions, autonomously, data movement, and access control. And there's a SAN management tool that shows graphically the state of the SAN. And reliable stats about performance. SpycerBox is another innovative add-on to DVS SAN or as a standalone content manager. It uses the Spycer software with internal storage and a fast connection to a SAN. And it can do cross conversion to MXF, DV and other editorial capable media. DVS other products Clipster and their OEM cards continue to be as they always have been. Solid and dependable. Bright Systems showed pretty much what they did at NAB. But there was a dramatic demonstration of the effects of fragmentation especially with systems shared between DI and VFX/CGI systems. Two working hard disks with glass tops so you can see the disk spinning and the head thrashing about looking for data. Enter BrightClip. This enables the server and BrightClip enabled apps to intelligently 'arrange' data to guarantee best performance. So this BrightClip disk head thrashes about much less than the non enabled drive. Ardis is a small Dutch company that have made a simple shared storage solution at a very competitive price. Just for sharing between editing systems. FCP, Avid, whatever. And for sound studios working with ProTools/Nuendo. They've tested it across Avid versions and FCP systems. They had a bunch of them on the stall. And it all seemed to work well. Some configurations also sport one or more 10GigE ports so one can connect fast-track stations that do film 2k and 4k. A 4U 12TB config supporting 8 uncompressed SD streams or 40 DV25 streams is EU 25,000, while the top of the line 30TB solution with 20 Uncompressed SD streams or 100 DV25 streams at EU 55,000. No spelling mistake. Aaton announced a new LCD based film recorder - AatonK - that records a whole frame at a time. Meaning not like Arrilaser that records line by line with a laser. The AatonK isn't shipping yet but claims to deliver cleaner pictures than laser based recorders. They even had side by side comparisons. Aaton has partnered with Filmlight to market this recorder using tight integration with the Truelight calibration within Baselight. Being LCD based there are no moving parts and the calibration is 'self-calibration'. The AatonK will record 3 fps at 2k and 1.4 sec/frame at 4k. Under the Nova name, MWA showed a real time film recorder capable of up to 30 fps. And can record from DPX, TIFF, CIN TGA etc. Just like a Cinevator which is also a real time recorder, this one too is a marriage between a HD video projector and a film camera. The Nova FlashRecord as it is called uses LED light source. It is a daylight operations recorder unlike Cinevator which needs a darkroom. The FlashRecord is much lower priced than the Cinevator, and I suspect, aimed at a different market too. Kinoton is amongst few film projector makers still standing. They showed a nice line of film projectors with configurations for small projection rooms. There are also options to remove the lens and place a video pickup to do quick QC type transfers from film to video - sort of 'poor man's telecine'. Which also keeps the projector in use when not showing film. Now i only they could make it do film to video transfer with a rudimentary keycode reader-burner, they'd have a ready huge market in India. Dailies. CTM showed small 16mm table top scanner transfer machines and even one for 8mm. And a simple 35mm film-video transfer system. News on the floor was that Thomson's Grass Valley division has been sold to private investors. Spirit and Bones are pretty much where they were last year. Except that this buyout might change the name - Maybe now there'll be Parter Spirit4k - assuming that's the new owner's name. Barco finally showed a shipping unit of their LCD broadcast monitor RHDM 2301. Good picture rich colours, blacks almost CRT like this is probably the best looking LCD picture so far. And with a CRT like field handling. Doing 4k anything needs a 4k monitor. Astra 4k LCD was everywhere. It shows every pixel in a 4k frame and has reasonably good colour contrast for an LCD. Seeing true 4k visuals on the gorgeous 52 in. LCD is quite a sight. I'm not sure of the pricing For a Red camera workflow with 4k files, this would make the perfect client monitor. Sony's displays are pretty much where they were last year. The LCD premium models are way too expensive for what they deliver, the mid range ones are average performers, and the prototypes are still prototypes. And there's still an engineer who has a English vocabulary of about 42 words demonstrating the 4k LCD. So its hard to get any real information on this monitor. Sony's 3D LCD playing out of an HDCam-SR was amazing. You still need to wear glasses. And if they aren't clean the effect is spoilt. But when it all works, its breathtaking. 3D viewing, 3D editing, 3D finishing, 3D compositing, 3D compression. 3D was everywhere at IBC. It seems film makers in the west have completely lost faith in people visiting theatres. So 3D is that one new thing that they expect will bring people back to theatres. After HD, its 3D now. Even though HD is still far from universal even on TV. At IBC there was this thrilling 3D theatrical presentation of clips from upcoming movies. And even a live HD 3D interview with Jeff Kratzenberg from LA to a large 30' tall screen in the IBC theatre. The screening of clips was full of bugs which showed that 3D is good fun if done right but is literally an 'eyesore' if goofed up. And this screening as well as the other 3D screenings all over the exhibition showed (at least to me) that there need for a certain 'grammar for 3D filming and editing. A trend to watch though. And Quantel is at the front of this 3D thing. A small Indian company in NOIDA makes this real time 3D graphics software for TV networks. What interested me was that it can import 3D files from 3DSMax and Maya and play them in real time - even in HD. The output is not as great looking as a rendered 3DSMax output, but is useful for quick client previews and timing and compositing trials. eMotion has been showing their speed change software for film and video. And now its better and works stably. As a by product it also does a bit of restoration and standards change. An ideal thing would be if these motion effect softwares could work with an EDL. This is a small external CD-ROM sized box that takes HD-SDI or SD-SDI inputs and alters dark areas to bring out detail, or cleans up burnt out areas. In real time. The Fraunhofer Institute continues to innovate. From an immersive all round screen to Digital Cinema Packaging as a complete solution. easyDCP is what its called. It can create complete SMPTE compliant DCPs or Interop DCPs. Sony's newest HDCam-SR VTR the SRW 5800 can be used to record 2k or 4k DPX files as data. An optional board is needed. And a simple interface permits recording and transfer of DPX files to an HDCam-SR.
At 1fps for 4k, 3 fps at 2k and 3fps at HD this is a slow DPX recorder. Even LTO3 works faster. And with the VTR costing in Rs. six figures, an HD tape in Rs. five figures, I didn't see the point. To make it worse, one 40 min HD tape holds 180 GB, and a 64 min tape about 260 GB. Arri showed a calibration probe for LCD monitors and projectors. It is also a LUT builder and builds LUTs for most grading systems. The probe is an XRite with their own software. A small grading panel from the most trusted grading panel making names. This is a $1500 device that currently works with Scratch, but will soon work with Apple Color. Good for a small quick grading system where a real colourist has to work. Arr has lenses and matte boxes for the new breed of interchangeable lens HD camcorders. So that the final distinction between prosumer and professional - the lensing - just got fixed. Matrox finally has an I/O solution that works. This one is for a multitude of edit systems - Premiere, FCP etc - and can be used in the field. It connects via a PCIe extension so can be used with Firewire drives. It also does HD/SD up/down conversion. Very cool. Sonnet whose RAIDs many people use for editing systems, showed a tiny 1TB RAID box that runs off laptop power and works via eSATA. This can be used in the field for direct HD recording or any other use. Sonnet also showed small desktop RAIDs all the way to multiple HD streams. Direct attached storage for the masses.